You guys… last night a miracle happened. I touched my toes. OK, maybe this doesn’t seem like a miracle. But it really is. This was the first time in my entire life that I’ve ever touched my toes. Seriously. As a runner (who totally never stretches before or after running… meh), I have super tight hamstrings. But even before I started running, I could never touch my toes. I couldn’t even come close. We’re talking barely past my knees. I was pretty pathetic as a kid in gym class trying to pass the Presidential Fitness Test (touching your toes was one of the tests!). Anyways, about a month ago I started going to yoga classes to try to get more flexible and to improve my posture (which is terrible). After only 4 weeks of going only once a week… I touched my toes! For the first time in my life! Nick is making fun of me for being so excited, but at least the yoga instructor was pumped. I really didn’t think it could ever happen, so now I’m totally a yoga believer! My garden is still pumping out zucchinis left and right so you fine folks get another zucchini recipe. This one is mostly healthy but much less healthy tasting than some of my healthy muffin recipes. These are quite sweet and super light and fluffy. Maybe one of the best muffins I’ve made yet!! Hooray!! In a large bowl, combine flours, baking soda, powder and salt. In another bowl, whisk together coconut oil, honey, yogurt, eggs and vanilla. Stir in the zucchini. Add the dry ingredients to the wet and stir until just combined. Fold in the coconut. Scoop the batter evenly into 24 lined or sprayed muffin cups. Bake about 20 minutes, or until the edges are just turning golden and a toothpick inserted into the center of a muffin comes out clean. I found that using half pastry flour made these muffins super light and fluffy for whole wheat muffins, but you could easily sub all regular ww flour or even all purpose flour. You can use the same amount of butter in place of coconut oil, but I like that the oil adds extra coconut flavor. Ta-da! The perfect way to use up some of your summer bounty. Lookin’ for more ideas? 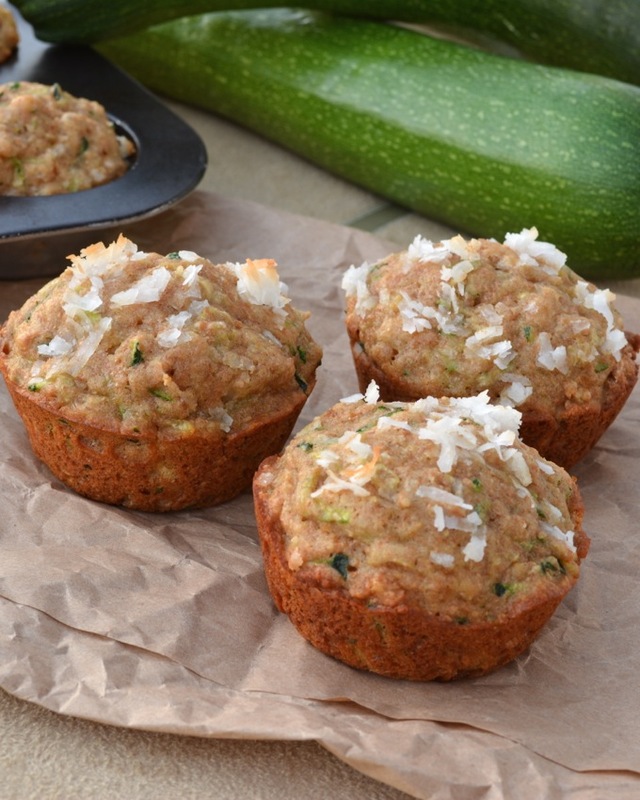 Check out my Healthy Veggie Muffins or Healthy Pumpkin Zucchini Bread. What are you making with all your zucchinis this summer? Do you love yoga?! Great job on the toe touch, Jess! 🙂 When I run (which is not too often) I never stretch, either! I love the flavor of these muffins! Definitely a fun twist with the coconut added! I love everything about this recipe! I am a huge fan of greek yogurt, and these look marvelous! So excited for you and your toes to be back together again 🙂 I recently lost 20 pounds and am just happy to be seeing mine again…. I am sooooo unflexible, always have been! I can’t get even close to touching my toes! 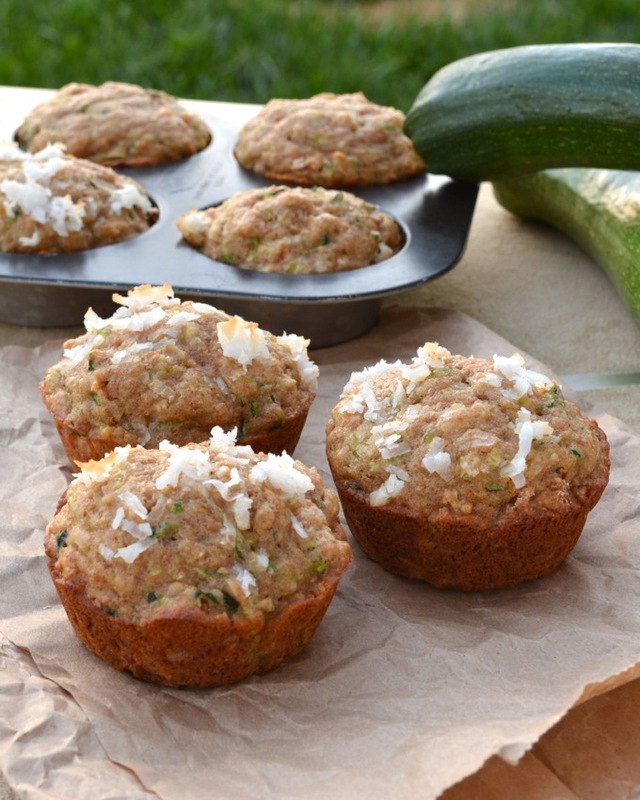 Love this muffin recipe, my garden hasn’t started pumping out zucchinis yet, but there are some teeny tiny ones now…and I’m going to have waaay too many this summer, so it’s always great to find new ways to use them up! Yay for yoga! I’ve become a yoga nut this year, so it’s fun for me to see someone else getting into it, too. Yay for small miracles!! 🙂 And I am loving these muffins! 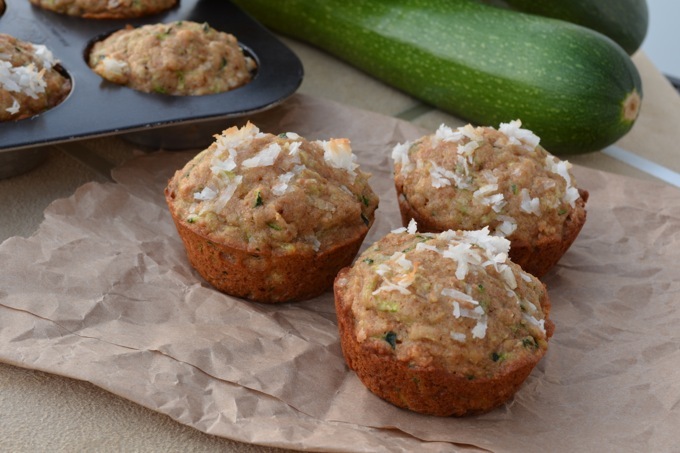 I add shredded zucchini to practically everything I bake in the summer. I just really like the texture it gives it! Love the addition of coconut! Hi Jess..Oh I am waiting for that miracle too! ha! Pinning this muffin recipe..I love anything muffins. These muffins look so delicious. I’m always looking for ways to use zucchini since I seem to end up with so much of it during the summer. Love that you combined it with coconut. Yum!